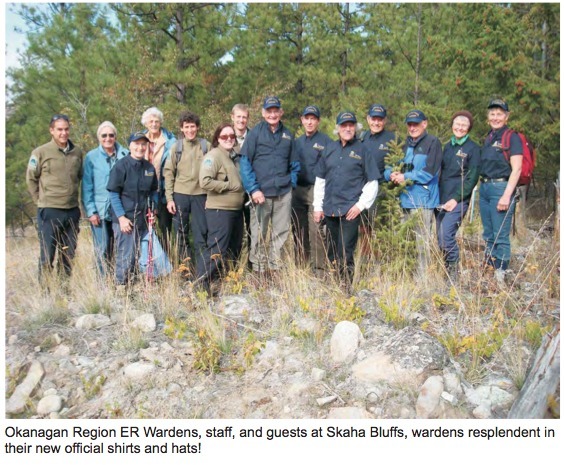 On October 12, 2010 nine of the sixteen wardens for Ecological Reserves (ERs) in the Okanagan, Similkameen, and Shuswap areas were able to attend the annual meeting and field trip organized by Sara Bunge, Senior Ranger, South Okanagan and hosted by the BC Parks staff in Penticton. This is the seventh year we have had this event which is a valuable combination of information exchange and field outing. The meeting began with John Trewhitt, Parks & Protected Areas Section Head, presenting certificates of appreciation to wardens who have volunteered for ten or more years. Wardens then gave a brief report on their ERs. These verbal reports are very useful for keeping other wardens and Parks staff apprized of conditions and concerns in the various ERs. At times, problems arise in more than one ER and the meeting is a good place to discuss ways to deal with them. Kevin Wilson, Area Supervisor, North Okanagan, went through a PowerPoint slide show, recently completed by ER staff in Victoria, for wardens and staff to use for public presentations. It can be revised to include material on specific ERs, so it will be very helpful for educating the public. I was particularly pleased with this new tool, as the need for more public awareness of ERs was discussed at the provincial Wardens’ Gathering in Kamloops in 2003, and a generic presentation was suggested as a good way to address the issue. Two more presentations completed the morning. The first was by Wildlife Biologist Orville Dyer on Red and Blue-listed amphibians that wardens may want to look for, especially the Western Toad and Spotted Frog. This was a follow-up to his discussion last year on similarly listed plant species. The second was Dr. Tom Northcote’s overview of the history of research at Mahoney Lake, and the current state of this very unusual and world- renowned, meromectic lake. Dr. Northcote, with Dr. Ken Hall, has carried out research on the lake since the 1960s so was able to give us a very comprehensive account of how it has changed over the past fifty years. The water levels are now lower than at any time since records have been kept, and one result is the beginning of a breakdown in the layer of purple sulphur bacteria that blankets the water a number of metres below the surface. This is having serious effects on the makeup and abundance of life forms in the lake and therefore on other creatures such as water birds whose species and abundance has declined sharply in the past few years. After a catered lunch, the wardens, staff members able to get away for a couple of hours, and Tom and Heather Northcote went on a blustery, but most enjoyable hike through the newly minted Skaha Bluffs Provincial Park. As always, we had a most informative and enjoyable day. Thanks again to Parks staff, especially Sara Bunge who makes sure this meeting happens each year.